The Vatican has admitted blurring part of a letter written by retired Pope Benedict XVI about his successor Pope Francis in a picture sent to the media. The ex-pontiff writes in defence of Francis, saying critics are wrong to suggest he lacks theological clout. In the visible text, Benedict praises a new series of books titled "The Theology of Pope Francis". But in the blurred part, he makes clear he has not read the volumes, which were written by high-profile theologians. The decision to alter the image has drawn criticism. Professional standards of photojournalism forbid adding or removing anything from photographs, especially manipulations that alter their meaning. Media outlets covering the Pope often rely on handout images from the Vatican. The former Pope's letter was sent to the Vatican Secretariat for Communication, which had asked him to contribute some "dense theology" to be read at a presentation for the book series. In his reply, Benedict said he was pleased the 11 volumes were being published, writing: "It contradicts the foolish prejudice of those who see Pope Francis as someone who lacks a particular theological and philosophical formation, while I would have been considered solely a theorist of theology with little understanding of the concrete lives of today's Christians." But in the blurred lines, he went on to explain that he could not write a theological assessment because he would not be able to read the books before the presentation, the Catholic News Service reports. Msgr. Dario Vigano, prefect of the Vatican Secretariat for Communication, read Pope Benedict's full letter at the book event on 12 March. The picture was released by the Vatican the same day, on the eve of Francis' five-year anniversary as Pope. 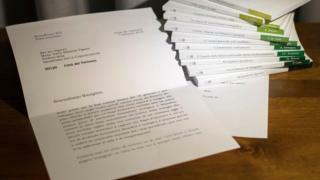 The Vatican press office has not commented on why the picture of the letter was doctored. It told the Associated Press that it was never intended for full publication. Though Pope Benedict is often characterised as a more hardline, doctrinaire pontiff than Francis, he has spoken warmly of his successor and his "goodness". For his part, Francis has praised Benedict's decision to resign from the papacy in 2013 as "courageous". "I think that a Pope emeritus should not be an exception," he told reporters in August 2014. "You can ask me: 'What if one day you don't feel prepared to go on?' I would do the same, I would do the same!"